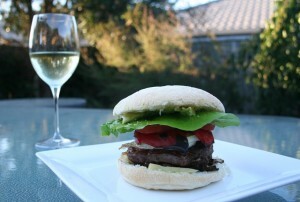 A typical sunny Marlborough day, perfect for a BBQ. Local supplier Premium Game do wonderful wild vennison patties, just needing some equally good ingredients to do them justice. 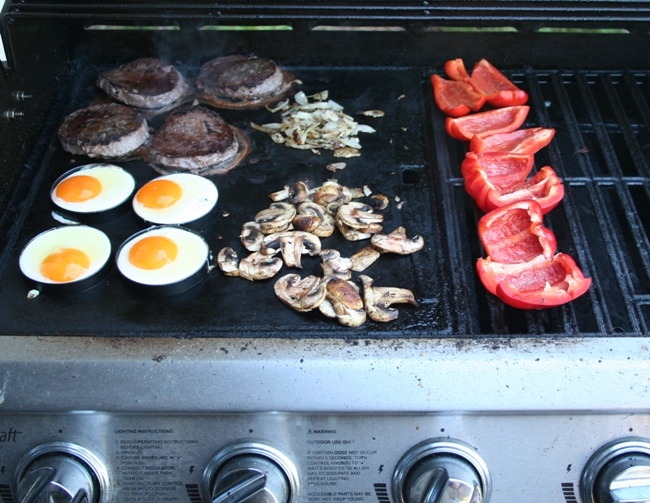 On to a pre-heated BBQ plate go the patties, with chopped shallots and mushrooms (unfortunately we don’t have anyof our own mushrooms at the moment), local free range eggs, and halved capsicums on the grill. With avacado, home made garlic aioli and freshly picked lettuce from the garden already on the inverted tops of the buns, some cheese on the base ready to be melted by the patties and the shallots and mushrooms. Stack the eggs and grilled capsicum on the pattie, then sliced tomato and gherkin. 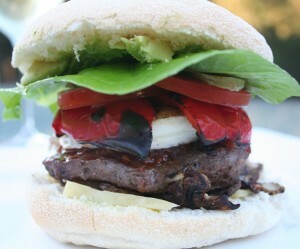 Flip the lettuce aioli and avo lid on top! Served with a lightly chilled glass of Riesling from Mud House Wines, an enjoyable outdoor meal.